Big news! We’re moving house! Big news! We are going to move! As some of you know, Dierenkliniek Vondelpark (Vondelpark Veterinary Clinic) is moving house. Our practice has been here on the Johannes Verhulststraat 115 since 1928 and we’re going to miss our home here very much. Over the years we’ve been beside you all through many highs and lows with your pets and have made many special memories here. Even though we’re sad to leave, we’re also looking forward to moving into our new location. Our new home is going to be Sophialaan 53. If everything goes to plan we will be able to move at the end of May. We will let you all know when our definate moving date is. Veterinarian Clinic Vondelpark will remain Veterinarian Clinic Vondelpark. We will always keep our warm and caring atmosphere regardless of where we are. 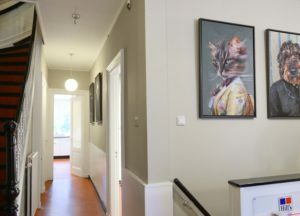 We’re looking forward to our new practice where the doors can close, where we have a special entrance and waiting room devoted to cats, where its nice and calm for our patients and where there are no steep stairs. Also a place where we can work according to the standards of modern veterinary medicine whilst still remaining in the area we love, Amsterdam Zuid. We’re looking forward to making new and happy memories with you all in our new home! Keep an eye on our Facebook page and website for updates on our move!